Barbecued pork brisket is crispy outside and juicy inside. Pork rib brisket is the cut left over when a full pork shoulder is boned out and the rest of the meat is divided into leaner cuts. It is not the most common cut in grocery stores or cookbooks, because it's fatty and has a substantial amount of connective tissue. 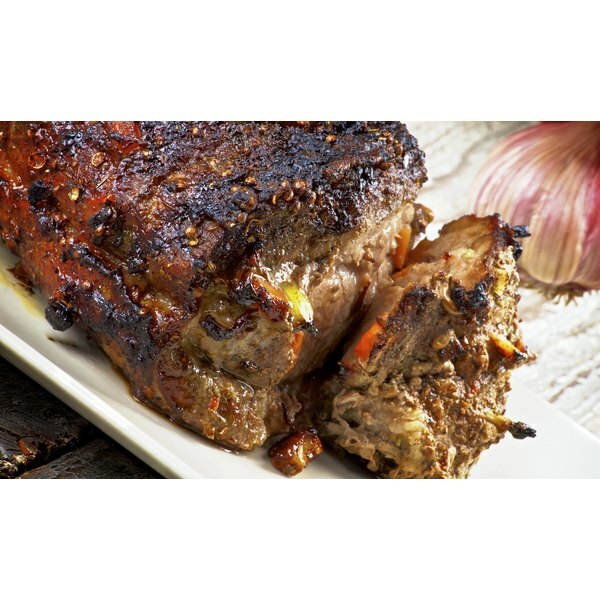 However, the connective tissue and fats break down with low and slow heat on a grill, allowing pork rib brisket to turn into a flavorful, tender meat. When you purchase pork rib brisket, look for meat that is marbled thickly with white strands of fat. For tender meat, select the fattiest cut available; a brisket with a 1/4-inch layer of fat on one side is ideal. Both the fat marbling and the fat layer will help keep the meat from drying out as it cooks, yielding juicier, more flavorful meat. Use powerful and sweet flavors -- such as chili powder, lemon, garlic, ginger, curry, soy sauce, brown sugar or fruit -- to season the brisket in a number of ways. For a dry rub, blend spices with salt and pepper, massage them onto the meat and let the flavor permeate the meat for an hour in the refrigerator. For a brine, blend salt, brown sugar and spices in water, then refrigerate the pork in the solution for 24 to 36 hours. Or fill a meat syringe with spices mixed with water, soy sauce or lemon juice. Inject the marinade into the brisket at several points all over the surface, filling the meat until the marinade is leaking out at several points. Refrigerate the brisket for as long as 24 hours before grilling. You must use low heat and long cooking times to fully cook a large, thick cut like pork brisket. Set up your grill for indirect heat to prevent burning the brisket. Do this by heating one side of the grill and cooking the pork on the other side. Wrap the pork in foil to prevent burning and keep the meat from drying out. Add smoky flavor to the pork brisket by placing a foil pouch of water-soaked wood chips beside the pork, over the fire, or by filling the grill's smoker box with soaked wood chips. Hickory and apple chips produce smoke that complements the flavor of pork. The pork will shred easily with a fork when it is done cooking; this generally requires about 30 minutes per pound when cooking over low heat. To prevent undercooking the pork, use a meat thermometer to determine when to remove it from the grill. 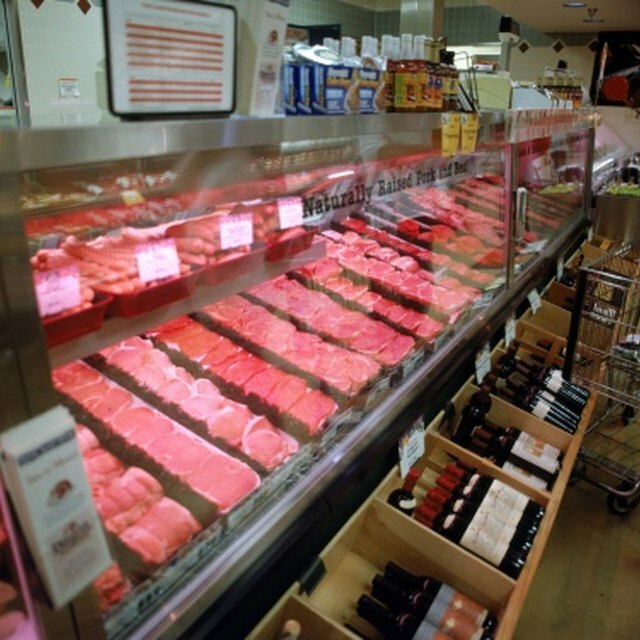 A minimum safe temperature for pork is 145 degrees Fahrenheit. However, most barbecued pork is cooked to a minimum of 165 to ensure that the connective tissue breaks down for tender meat. Poke the meat thermometer into several locations on the pork to ensure that all points register a safe temperature. When the pork brisket has finished cooking, allow the meat to rest for 30 minutes so the natural juices return to the center. While the meat rests, top it with your favorite barbecue sauce for added flavor. The cooked pork will easily slice or shred when you are ready to serve it. Prepare shredded pork sandwiches or sliced pork brisket with sweet potatoes.